Before pregnancy, celiac antibody levels should be normal. See this PubMed search and the videos titled Katie Bruno. Something else to consider, especially during pregnancy, is that gluten-free food is typically NOT enriched, potentially leading to deficiencies. Enriched wheat flour has added B vitamins (thiamin, riboflavin, niacin, folic acid) and iron, and may also have added calcium. (Here is the FDA's rule on Enriched Flour). 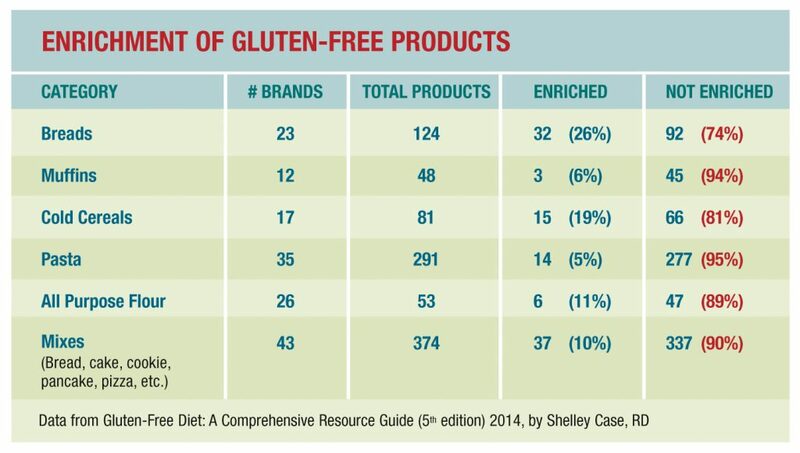 Information about the enrichment of gluten free products is found in this chart from the article Injecting Health into the Gluten Free Diet . From page 2 of this article: Folate, or vitamin B9, is most abundantly found in dark green leafy vegetables, but also in orange juice, legumes (e.g., black beans and kidney beans), nuts, asparagus, and strawberries. With the exception of liver, meat is not a good source of folate . Folic acid is the synthetic form of folate and is usually more bioavailable than natural food folate. Due to its lower bioavailability from natural foods, many countries have adopted mandatory folic acid food fortiﬁcation programs. Liu E., et al. Risk of pediatric celiac disease according to HLA haplotype and country. The New England Journal of Medicine. 2014;371:42. 2018: Cesarean Section on the Risk of Celiac Disease in the Offspring: The Teddy Study. Introduction of Gluten, HLA Status, and the Risk of Celiac Disease in Children Neither the delayed introduction of gluten nor breast-feeding modified the risk of celiac disease among at-risk infants, although the later introduction of gluten was associated with a delayed onset of disease. At 2 years of age, a significantly higher proportions of children in group A (those who were introduced to gluten at 6 months of age) than in group B (introduced to gluten at 12 months of age) had celiac disease autoimmunity (16% vs. 7%, P=0.002) and overt celiac disease (12% vs. 5%, P=0.01). At 5 years of age, the between-group differences were no longer significant. A high-risk HLA genotype was an important predictor of disease. Randomized Feeding Intervention in Infants at High Risk for Celiac Disease As compared with placebo, the introduction of small quantities of gluten at 16 to 24 weeks of age did not reduce the risk of celiac disease by 3 years of age in this group of high-risk children. In this study, genetically susceptible children under age 2 who ate more gluten were more likely to develop CD.